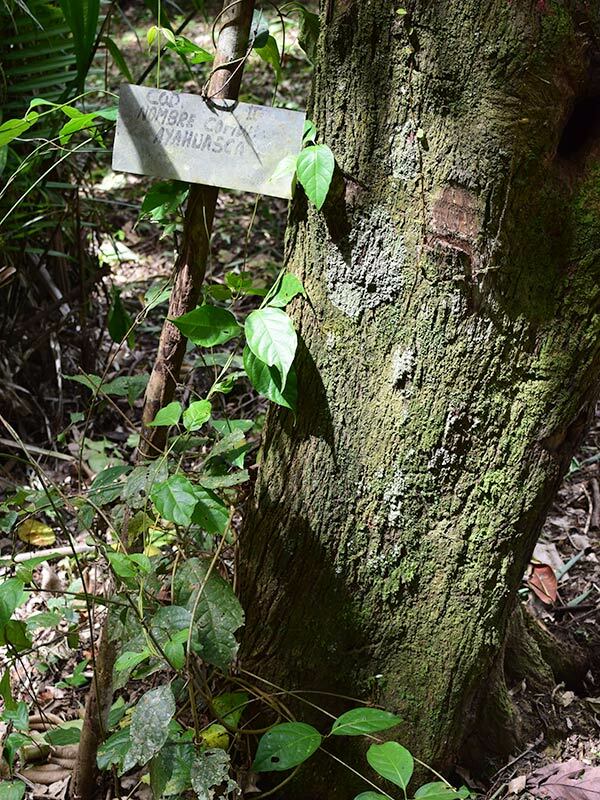 The Temple aims to become a self-sufficient producer of ayahuasca and to model a responsible production method for this sacred medicine, through incorporating the ayahuasca vine (Banisteriopsis caapi) into our agroforestry systems on the Temple’s 200-hectare property. Our efforts seek to counter the trend of the over-harvesting of ayahuasca in some locations in the Amazon and the devastating effects of industrial development and agricultural practices that undermine the forest ecosystem in which this plant medicine grows. years and if the current method proves compatible with the local ecosystem, we hope to increase production three-fold. Ayahuasca takes at least 10 years to grow in natural conditions, with the first five years typically being a relatively slow growth stage due to the young vine needing to grow to a sufficient height to reach the canopy and be immersed in regular sunlight. Usually after about 10 years the vines are then ready for sustainable harvesting, through cutting off sections of the branches and leaving the roots intact. The production of ayahuasca is part of the Temple’s broader mission to develop sustainable living systems that are not only self-sufficient, but also give back to the land. Though there is limited modern scientific information on how ayahuasca grows in its natural habitats, current evidence suggests that ayahuasca encourages biodiversity. Crucially, this is supported by traditional understandings about the numerous varieties and growth stages of Banisteriopsis caapi and where it grows under optimum conditions. We are committed to participating in further research into the impact of ayahuasca production on the local ecology and how to protect the plants from external environmental threats. In addition, over the last three years we have been experimenting with growing chacruna (Psychotria viridis), the medium-sized leafy shrub that is combined with Banisteriopsis caapi to make ayahuasca medicine. Most of the soil around the Temple is not optimal for the production of chacruna due to its high sand content, so we have been planting chacruna in many different locations to see which soil types work best. In 2014, we discovered an area on our property where chacruna grows well, so we are now focusing on planting many young chacruna plants in this section of the local forest. Working with local experts, we have also learned that chacruna is traditionally cultivated alongside yarina – an ivory palm (Phytelephas macrocarpa) that is commonly used for roofing in local communities. It was by observing and then mimicking the growth and diversity patterns found in the surrounding rainforest that we identified the ideal conditions and locations within the layers of the ecosystem for the production of our ayahuasca vines and chacruna plants. We are now monitoring the effects of our work and this ‘feedback’ from nature will inform our future management plan. By following these permaculture principles, the Temple is ensuring that our local stocks of both ayahuasca and chacruna are cultivated successfully, and will be harvested sustainably and with the utmost respect. One of the key practices of permaculture is respecting the symbiotic relationship between the parts and the whole. The Temple understands that our production of ayahuasca takes place in a context of cultural and economic sustainability in the broader region. We believe sustainable production must benefit both local communities and our guests, and ensure this potent healing medicine is available for all who wish to approach it with respect for the healing traditions from which its usage has emerged. We are also alert to both the positive and negative implications of the growing interest in ayahuasca healing in the Amazon. At its best, the demand from Western visitors can benefit local communities and shamans. At its least helpful, commercialization can compromise the integrity of the traditional usage of ayahuasca. We are mindful that respect for the arduous training required to develop traditional plant-spirit healing skills is being eroded because of its perceived lack of status as the effects of Westernization and evangelism permeate Amazonian society. There is also concern about inadequately trained practitioners claiming the status of curanderos solely for financial gain. The Temple aims to bring honor and respect to traditional Amazonian healing practices, and legitimize their use not just in the modern world but also among local communities. Through working only with highly experienced Shipibo healers deeply committed to the practice of their ancient healing art, the Temple is re-establishing local respect for traditional Amazonian healthcare as a cultural practice and an economically viable occupation. We hope to provide a quality benchmark for all ayahuasca centers in the Amazon to reinforce a minimum standard of curandero experience, safety protocols and culturally sensitive interactions between healers and guests. The other significant economic concern is the exploitation of ethno-botanicals in the Amazon. The Temple recognizes traditional knowledge-holders’ rights to benefit from the sale and use of traditional medicines such as ayahuasca, while still ensuring that local people have access to plant materials at affordable prices. To date, multinational pharmaceuticals have reaped most of the economic benefits of their bio-prospecting, despite being guided by ancestral knowledge and countless years of tradition. We support the model put forward by the Nagoya Protocol of 2010 that requires companies to gain prior and informed consent from governments and traditional knowledge-holders before seeking to sell new ethno-botanicals, and ensuring access to, and profit-sharing with, traditional knowledge-holders. The Temple further promotes research that validates traditional knowledge-holder’s intellectual property and we aim to serve as a model for the sustainable production of ayahuasca and the practice of ayahuasca healing that appropriately remunerates all stakeholders. We are dedicated to acting with total social responsibility within a reciprocal relationship with the environment and our local communities.